If you’re a parent of Gabba Land, you recognize that greeting anytime you hear it on the television. Yo Gabba Gabba has been a favorite in our house since it’s inception, starting with Sonny and his request to watch it non-stop. Thanks to on-demand viewing, we’ve been able to select the shows the kids watch, and Yo Gabba Gabba is always at the top of the list. Now, we have yet another option, an app! The Yo Gabba Gabba HELLO FRIENDS app is a cute new addition to the app stores and for Gabba fans, and those new to the show, it’s a great way to get your fix of fun. I let 2 year-old Duchess try out the app on my iPhone for over a week, hoping for at least a few minutes during the morning to take a shower in peace. What I got was a toddler, quiet, and enjoying half an hour of games, videos, and “phone calls” to her favorite characters on the show. So far, her favorite part of the app, are the shows. There are clips of some of the most popular songs from the show. My favorite part of the app is the Brobee Jump game. Yes, I play with the app too! 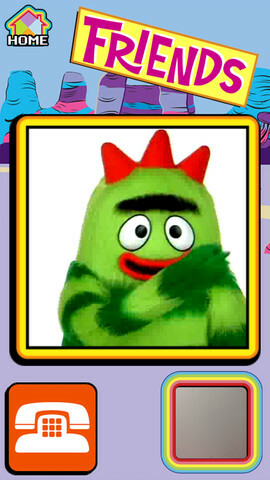 Brobee jump seems like a game geared towards older kids, at least 5 and up. Now, let’s talk price. The app is priced at 3.99 in the apple app store. Yikes, I know. But, there are so many different features that will keep your preschooler busy, it’s well worth the money. Plus, you can’t put a price on being able to talk to Foofa face to face. Boom. The Yo Gabba Gabba HELLO FRIENDS app is available for the iPhone, iPad, and iTouch, and it’s also available for android devices. You can find it on the iTunes app store and on Google Play. Disclosure: I was offered the app for review but all opinions, mine and the Duchess’s, are our own. « #FashionFriday – Boots, Boots, Boots!